I saw parts of this movie. It was very very strange. It can't compare to the book - seeing as how you can read the chapters of the book in any order and it will still make the same sense. 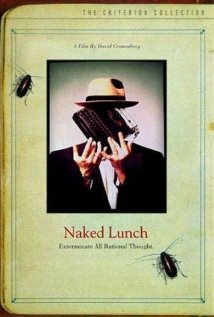 I guess what I am saying is that the movie has a plot.. while the book.. just drifts..
Exterminator Bill Lee finds himself following his wife into an addiction to the bug powder he uses. After accidentally killing her, he descends into a hallucinatory existence in which he imagines himself a secret agent answering to a series of bizarre creatures. He channels his energies into writing "reports" on his delusional mission, while trying to break his addiction. The story loosely reflects events in the life of author Burroughs as he wrote the novel.